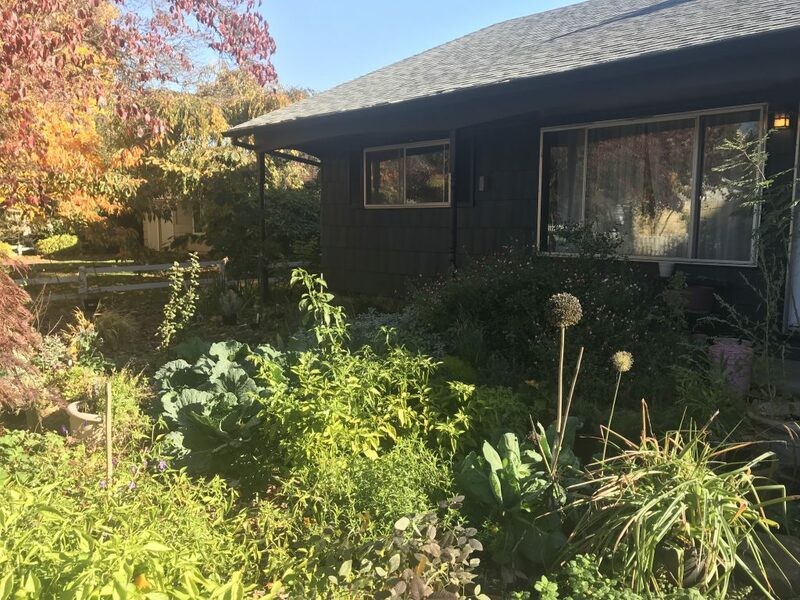 When we first started gardening here, in 2014, the initial intention was something along the lines of “food forest” and/or to grow as much edible stuff as possible. I still love doing that and always will (I think?) but the more I get into botany and climate-adapted plants and cool stuff from Australia, the more I find myself edging toward “sustainable” rather than “edible” — and those two are often (but don’t have to be) mutually exclusive. I also just like growing weird plants. 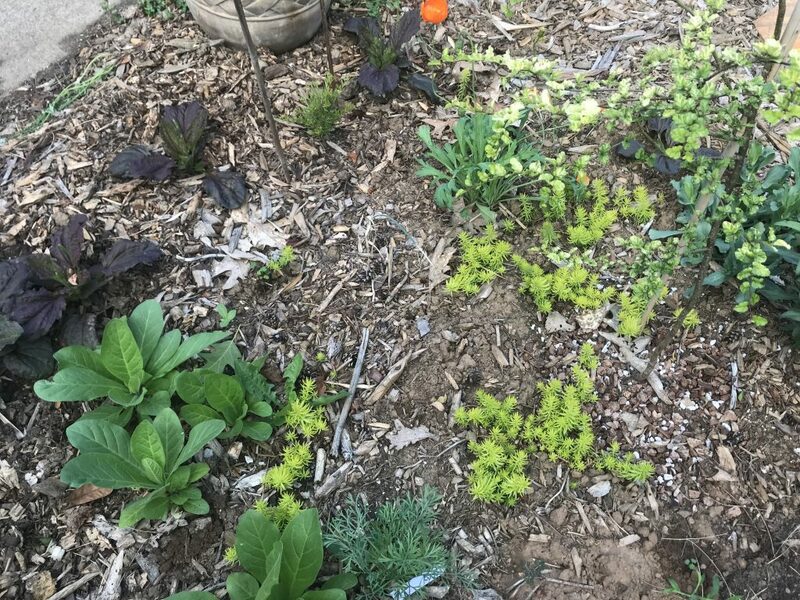 My fellow garden blogger Lance has some really wonderful essays on what “sustainable” really means. I’ve been reading Lance’s writing for years and his impact on me is immeasurable. 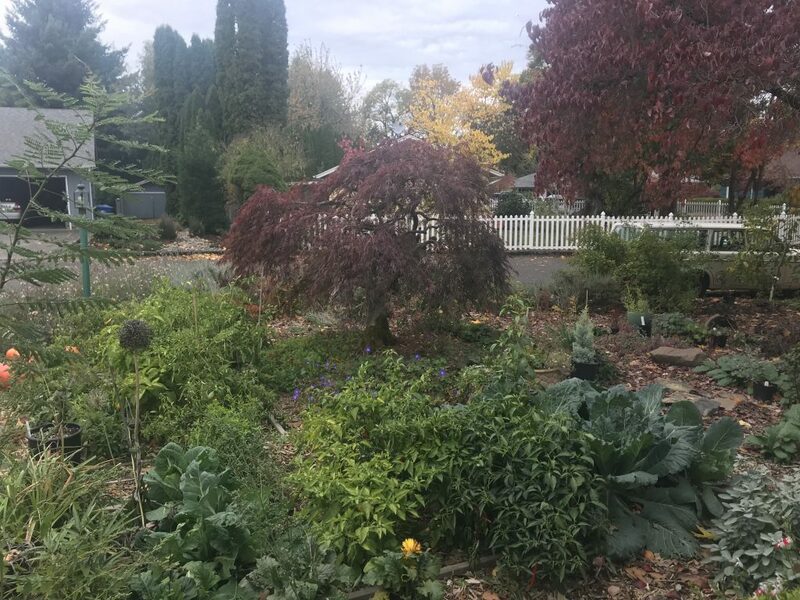 For any gardener in the west coast of North America, understanding of sustainability, as well as the distinction between “drought-tolerant” and “climate-adapted” are really important, notably because of summer drought, which, while it’s normal here, is a thing that can severely impact us and can and should influence our plant selections and garden designs. 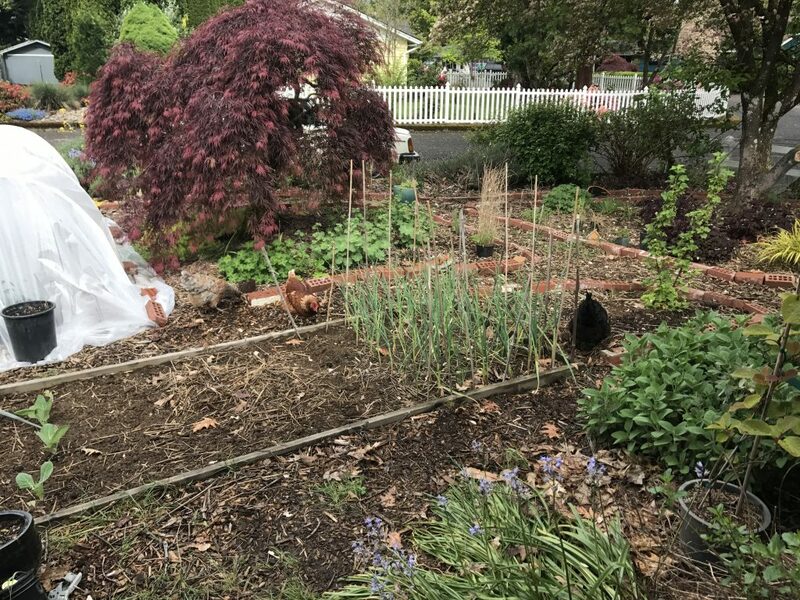 In my northern Willamette Valley garden, growing vegetables in a home garden is generally terrifically unsustainable but also really fun because we have a long frost-free season and mostly excellent soil. 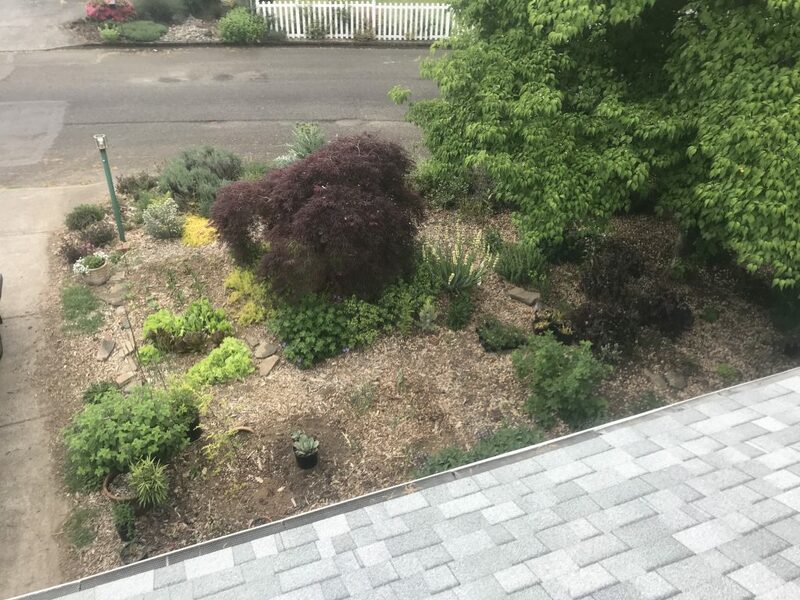 Still, it’s a lot of work and uses a lot of water to grow plants that are not at all climate-adapted to a dry-summer Pacific Northwest climate (ok some are better than others, but it also depends on how you work with the seasons). I do it all anyway because I enjoy it, but I fully understand that this isn’t by any means about saving money, time, or water. 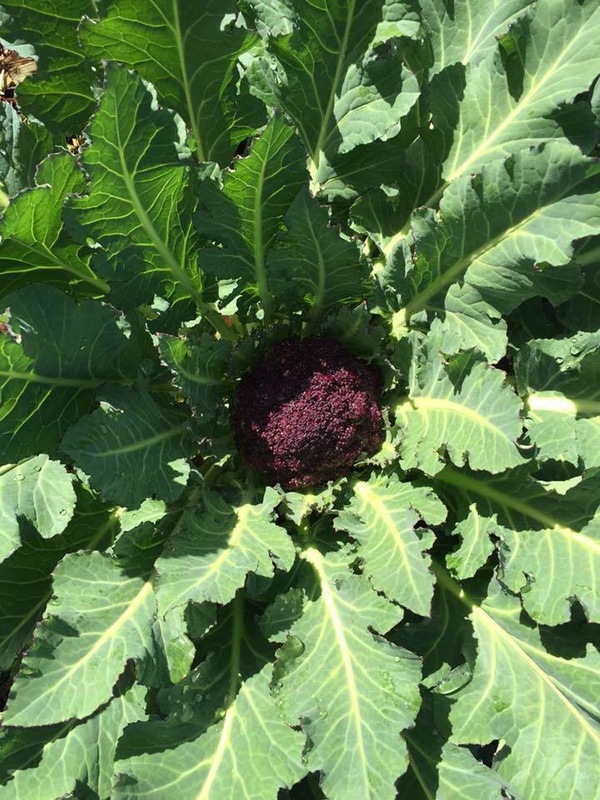 It’s about my sanity, it’s about botanical experiments, and it’s very much about the immense joy that David and I get out of eating seasonally, preserving, and having our meals dictated at least in some part by what is available to eat in the garden on any given day. 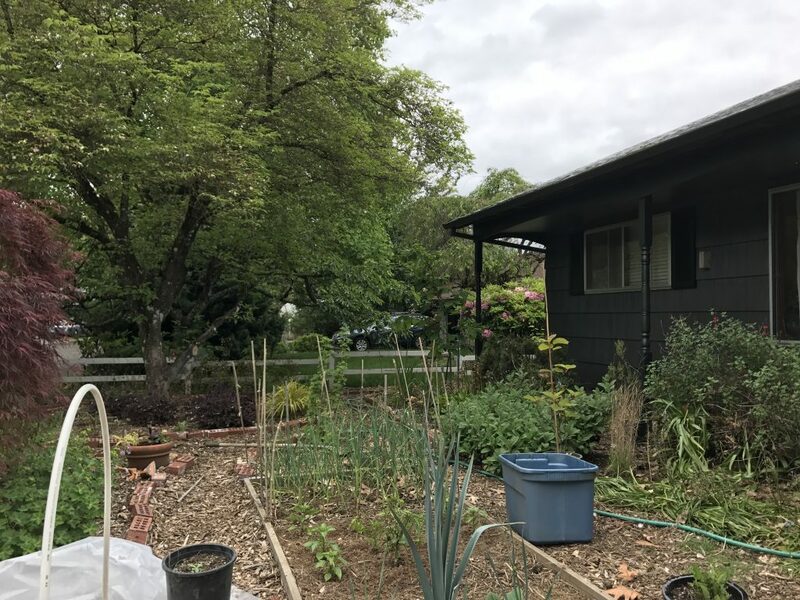 All that said, my own focus in gardening has definitely shifted from “food forest.” I still want to grow things we can eat, but not only edibles. 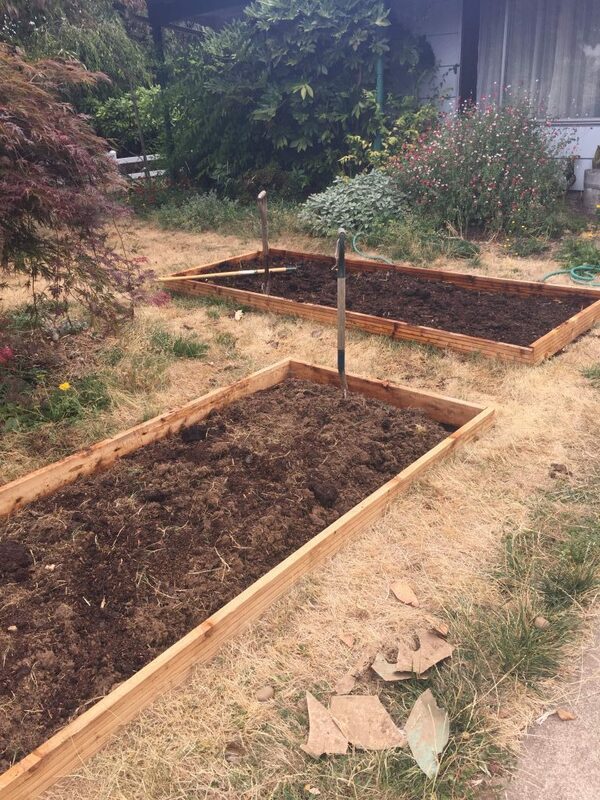 In 2015 we established two 4′ x 10′ vegetable gardening beds in the front yard, in areas that were previously lawn grass. We edged them with 2×6 cedar as we did with the 9 similar beds we have in the back. Mind you these are not, for the most part, raised beds. I’d call them “edged beds” because most of them aren’t raised at all – the cedar edging merely helps to keep grass and clover out. It works. 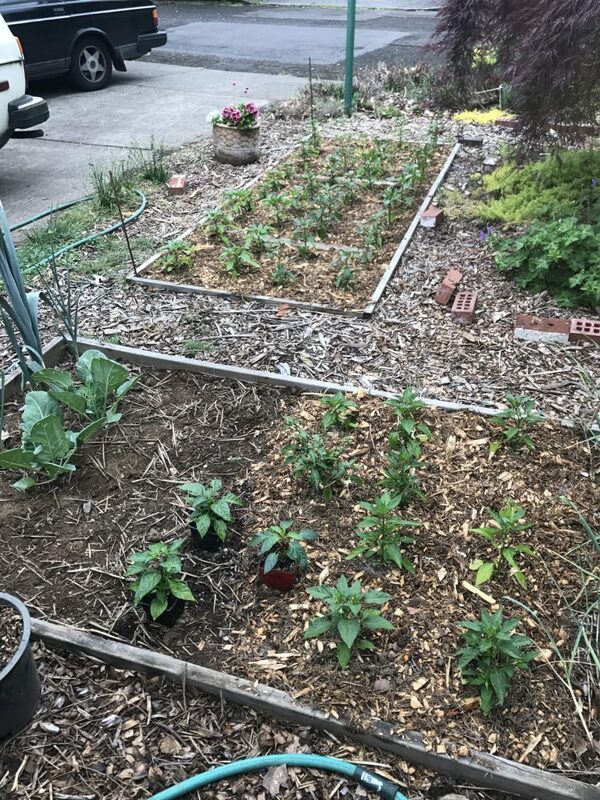 This year I decided to convert one of the beds in the front from an edged edible garden bed to an ornamental bed. A lot went into that, and now I want to show the whole entire process. The first year we planted brassicas and leeks. I recall some of those being collards – evidently before I realized you don’t need to grow collards if you grow all the others because you can use the leaves of any of them. Also apparently I thought you had to blanch leeks by planting them deep and backfilling. You don’t. Cabbage and leeks. The board looks bent but it’s not. 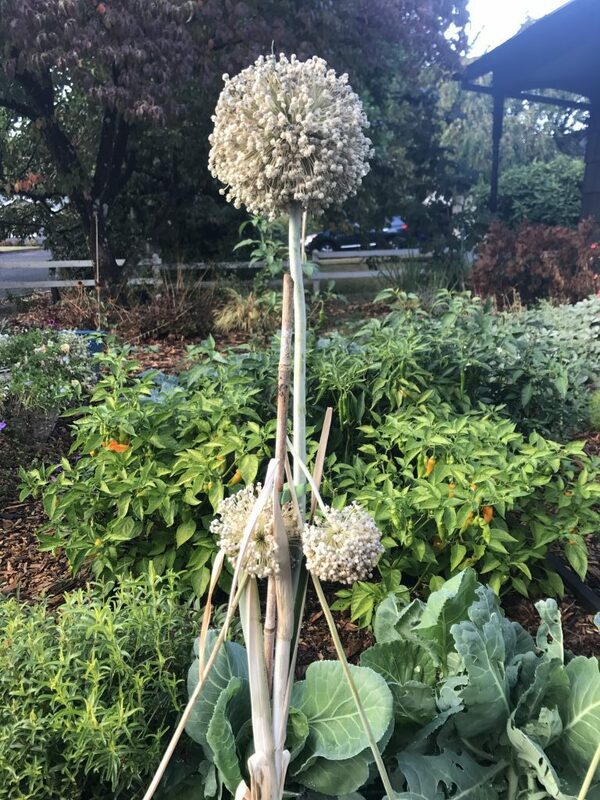 garlic on the right, planted the previous fall. Peppers will go in the middle. How did those chickens get out there?! Another angle, same work session: leek in front, garlic, peppers added. All those bamboo sticks are to prevent our gigantic horse-dog from smashing through there. And did not plant it into the ground. 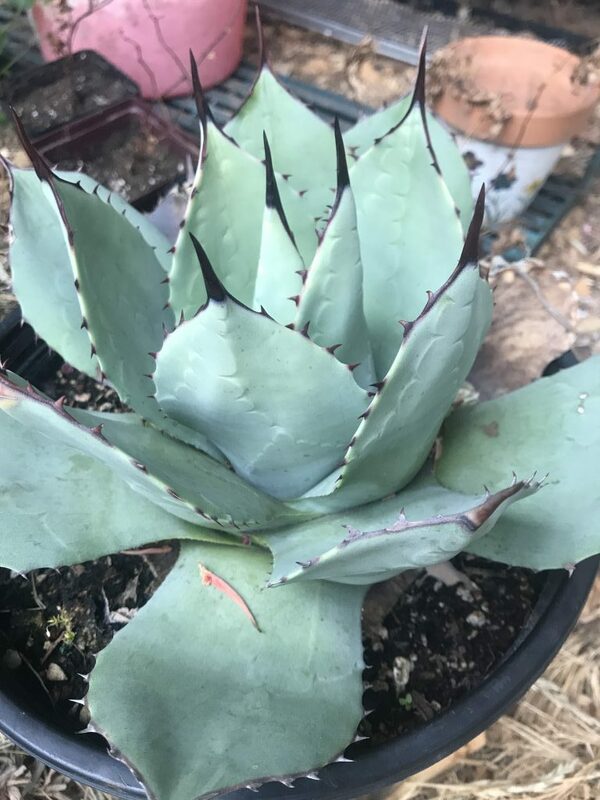 Instead, I started to slowly re-imagine this scene with a more silver-blue-gray color scheme while the agave spent the winter in its pot under the eave, not getting much sun, nor water. My color fetish caused me to take a trip to Xera Plants for Cupressus glabra ‘Sulphurea’, which you can see here auditioning its spot, along with several other plants you can’t really make out. I also got a Caesalpinia gilliesii which ended up spending the winter in a big pot under the eave with the agave. In late fall of 2017, Robb Sloan of NoName Nursery handed me a whole flat of Pulsatilla vulgaris ‘Rubra’ or is it var. rubra? Joy Creek calls it ‘Rubra’ and Far Reaches calls it var. rubra. Joy Creek is closer so we’ll go with ‘Rubra’. 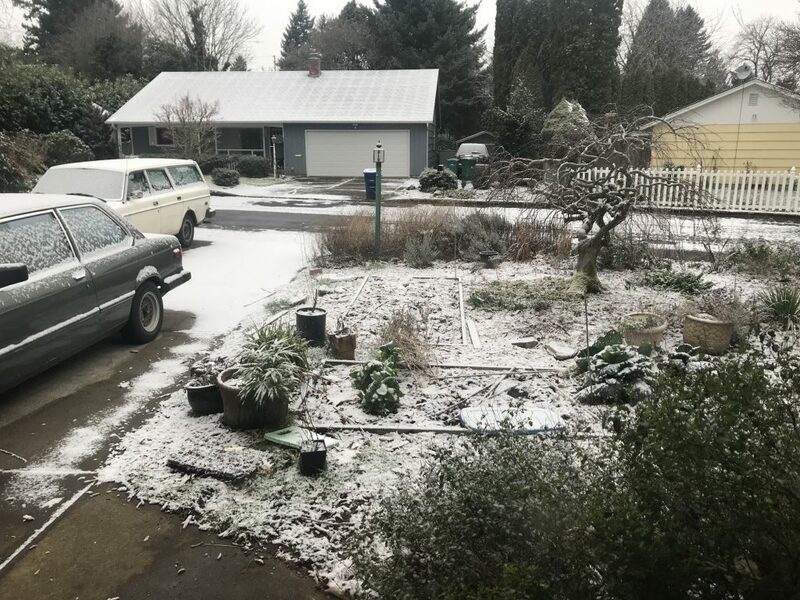 I briefly considered planting some of them here, and in this pic showing February 2018 snow dusting on my mess of a front yard you can see the flat in the lower left. That is one tough plant and I really put them to the test by leaving them out there all winter. None of the 50 of them died. Pot ghettos at my house happen when I end up with plants I’m not sure what to do with yet, such as those Pulsatillas, or when I can’t plant them because I have to prepare the area (remove grass, usually). And that’s exactly what started accumulating here. I hated it. This is the most prominent part of my entire garden for us, it should be the most beautiful and interesting, not a stupid eyesore! I’m an idiot sometimes. Finally after much thinking I decided to at least remove the wood bed edges. I did it to both beds but apparently only took a photo of this one. 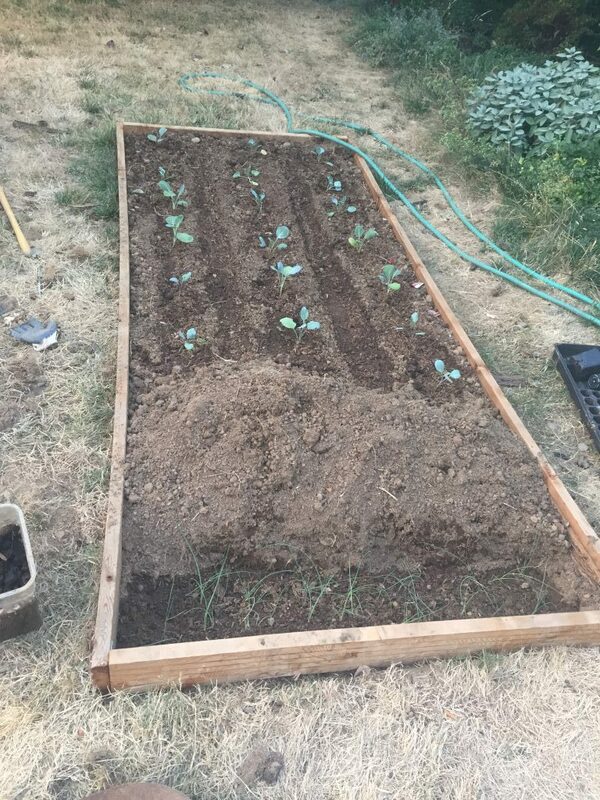 At this point I’d finally made the decision to keep the bed below for vegetables, but convert the other to ornamental. cedar removed, March 2018. Here I’m about to put in a flat of lettuce and onions. Still I wasn’t sure what to plant there. Sometimes I guess you just have to wait for inspiration. One day in about April of this year, it finally came, in the form of a small tree from Paul Bonine of Xera. It was labeled as Nothofagus antarctica ‘Variegata’, which apparently is synonymous with the cultivar ‘Chillan’. I immediately knew exactly what to do with it and planted it out right in the middle of the south end of that bed. 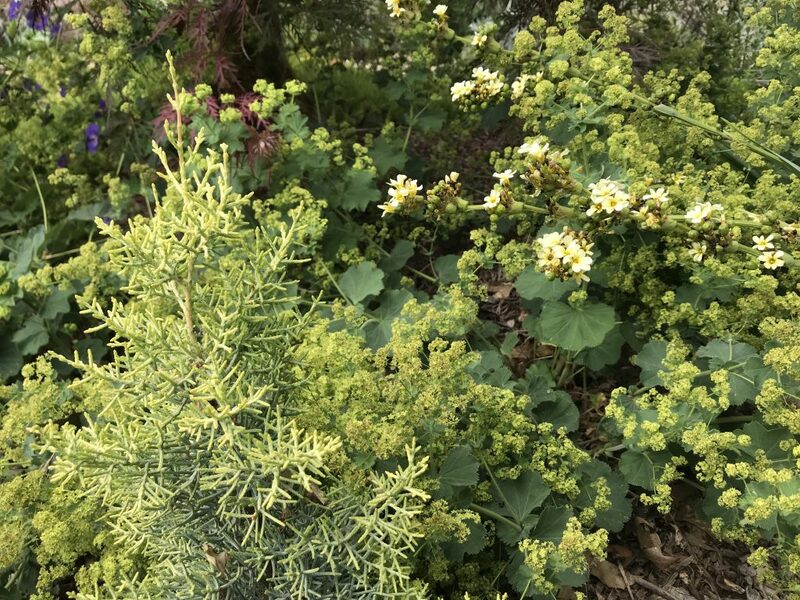 The brilliant chartreuse of the Nothofagus is just what’s needed to balance a bunch of silvery-blue desert plants. And I’m a sucker for microscopic leaves. This is the perfect specimen plant to anchor this area and get me to plant the rest of it. Nothofagus casts so little shade, I don’t think it will be a problem even when it gets taller. 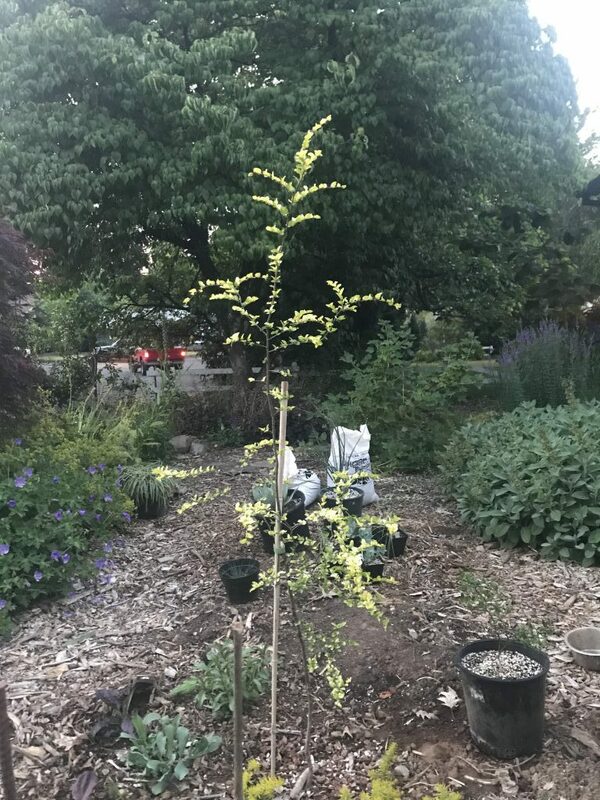 Initially I wanted to plant the agaves (yeah I ended up with another one, from Little Prince) just to the south of the Nothofagus but that would be too close to the driveway. Rudy the dog would inevitably spear himself on them as he spills out of the car on that side usually. They need to be further away from heavily trafficked areas. 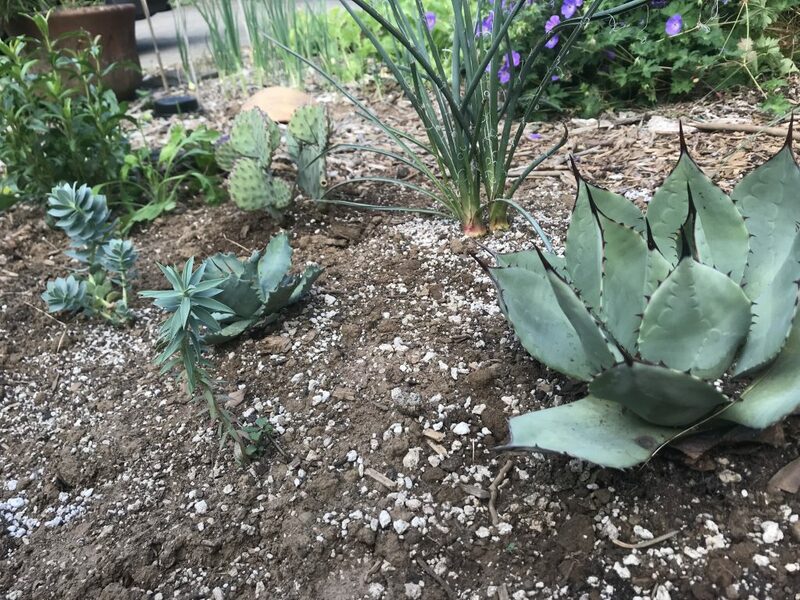 Once I decided on the spot, more plants materialized to accompany agaves. Euphorbia rigida and Euphorbia myrsinites which came from Amy Campion at the swap, a Hesperaloe parviflora from Xera, an Opuntia macrocentra which – don’t hate me – came from Home Depot, and a couple of Stipa barbata which also came from the swap but I’m not sure who brought them (please LMK if it was you!). In the above picture I’ve gathered up the two agaves and the various other plants that I think will compliment them and I’m about to dig in a couple bags of pumice which I got from Concentrates, Inc. I get my potting soil, fertilizer, and bird food there too. I love Concentrates! Papaver nudicaule, Angelina sedum, Plantago major ‘Rubrifolia’, and Cerinthe major. I planted 6 Plantago major ‘Rubrifolia’ around here and I love them. They are a wonderful contrast to the sedum and the bright orange poppy. 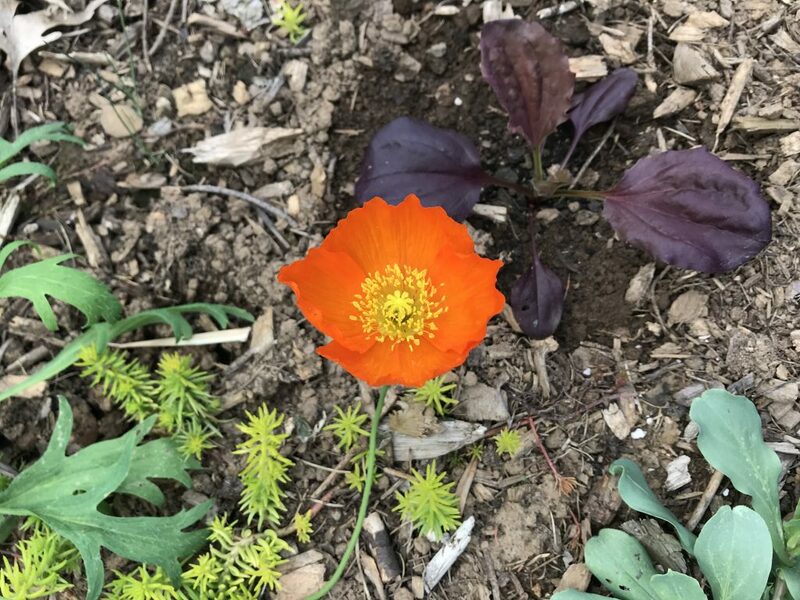 Evan grew the Plantago from seed, and I grew the poppy and the Cerinthe from seed (found Cerinthe seeds at Garden Fever). I also blame Evan for the poppy because the inspiration to grow them was sparked by a conversation with him about poppies back in March. Oh, hey, a california poppy ended up in here too. That is fine. You can’t see it well, but in the above photo, flanked by two red plantains to the left of the poppy is a Grevillea australis. I’m hoping it will be a better choice than agaves for this area – dense, painless, floral scent can be experienced up close easily, etc. I’ll probably end up with more stuff like that along the driveway eventually. The rest of these I will allow to do whatever they want and just edit as needed. My favorite kind of gardening is these kinds of naturalization experiments. I wish I’d taken this from the same angle as the previous photo – I was focusing on the tree. Too sunny today for a better pic! Just to the right of this scene there is more chartreuse. It just ends up happening: the foliage color scheme in the front yard is decidedly silver/gray, chartreuse, and red/purple, and an even mix of all three. I can live with that. Let’s see how long it takes that Cupressus to become a problem. Should be fun! Now that I think about it, it occurs to me that the way I seem to design the front garden is reactionary. 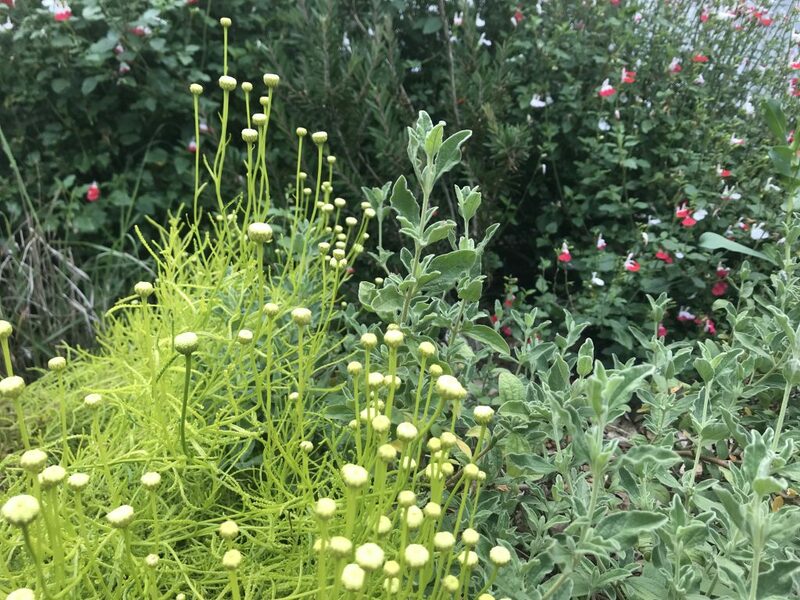 These two plants absolutely a reaction to the Salvia ‘Hot Lips’ behind them – I find the color of the Santolina especially, and also the flowers of the x Halimiocistus, help me deal with the gaudiness of the red and white Salvia. Instead of removing the Salvia, I’m planting things around it to make it work. You can’t see it well but there’s a Callistemon viridiflorus in there too, to help satisfy my craving for light yellow/chartreuse next to red. I’m doing that with the big red Japanese maple too. I may change my mind eventually and take it out, but for now, it’s really helping drive some design decisions. 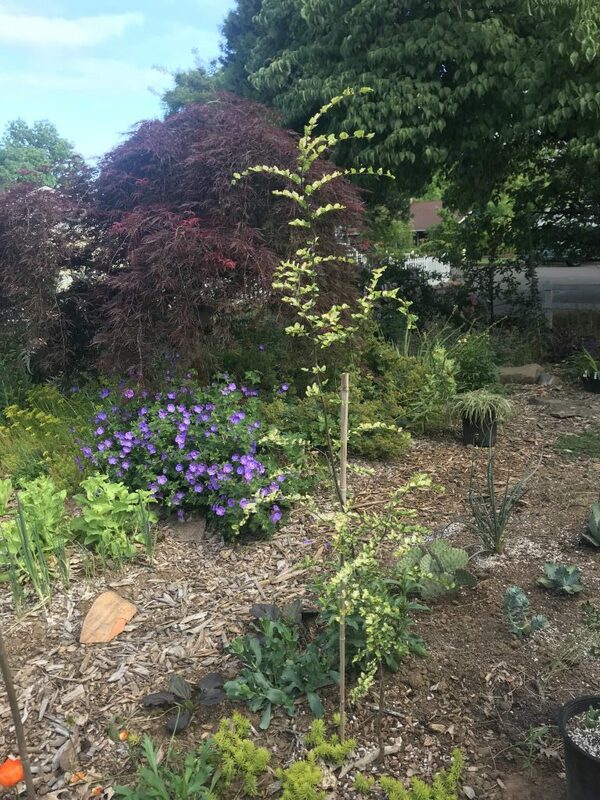 In fact, that tree dominates the entire front yard and affects almost every decision I make, whether it’s about foliage color, plant form, or plant placement. The venerable maple demands to be part of the conversation. For someone new to garden design such as myself, this isn’t just helpful but necessary. 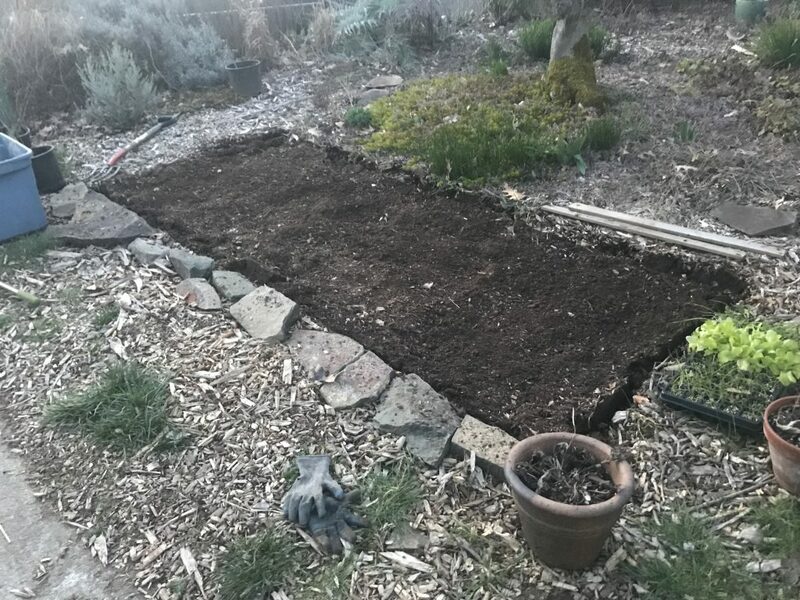 This has been a “before” and “during” post for this part of the garden, formerly vegetable bed #10, and now it’s basically two zones – the immediate surrounds of the Nothofagus, and the desert berm. Hopefully they’ll mush together a bit as the reseeders migrate around and I’ll end up with something interesting that relates to the rest of the front yard at least somewhat. I should probably mulch the berm or add rocks? What would you do? Cram some more plants in there? All these plants are brand-new to me so I’m very interested in suggestions!